Time surely has no sense of time! Well the way the days have rolled into weeks, left me amazed that I am doing the 3rd group of the Blogging Marathon. And two weeks have just gone so quickly. Though I never thought I will do the rest of the weeks, somehow didn't feel good letting the group do the hard work without pinching in. I wanted to make things little easy for myself and decided to do 30 minutes meal for the next 7 days. Most days this is what happens at home. With me cooking the breakfast and lunch at the same go and managing it well within time for everybody to leave on time. My usual menu revolves around dals, sambars and pulaos in a week. When I make Dal or Sambar, it is the usual Rice, Vegetable side dish, Rasam and Curd Rice. 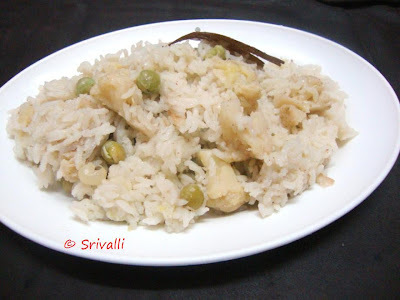 When it is Pulao, if the rice is mild a vegetable curry is made, else a simple onion raitha. Making an Indian Meal within 30 mins is surely possible when you have certain things done ahead. Also I start my cooking with the pan on the flame and then get my things ready as I cook along. There is really no time nor need to get all the ingredients ready on the table for you to start cooking. Of course that helps for a novice or if you are attempting a new recipe. For Pulaos to get ready quickly, here are the addons that that you can consider getting done ahead. These can be made ahead and usually stays good as mentioned in the post on their shelf life. Wash and soak the basmati rice for 10 - 15 mins. Clean the cauliflower and soak in salted hot water for 5 mins. Shell peas if you haven't already done ahead. Put the pressure cooker on low flame, while you chop the onions. Add oil to the pan, drop in all the whole spices. If you are using green chili paste, add it now else, the slit pieces along with ginger garlic paste. Saute well for couple of mins. Then add the onions, saute till it turns colour, then add the cauliflower florets and peas. Continue cooking in low flame for 2 more mins for the vegetables to get thoroughly mixed with the oil and spices. Get the flame to high flame, saute well. Then add drained rice and saute again. Measure out 1 & 1/2 cup of water, add coconut paste, salt and cover with lid. Pressure cook for 2 -3 whistles depending on your cooker. Serve with Onion Raitha for a complete meal. When you make this pulao with whole green chilies, it tends to be mild. So you may increase the spice or serve with a curry as side dish. Else if you want to serve this spicy, add the green chili paste and make it fiery.